Every quilt has a story just waiting to be told! 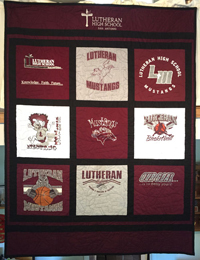 Memory quilts are ideal for telling the story of an individual’s journey through athletics, band, dance, drama, the military, the workplace, vacations, etc. 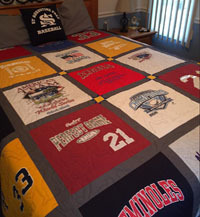 Aerie Designs makes custom quilts using your t-shirts (sports, school, destinations, military, etc.) perfect for graduations, retirements, vacation memories, and other gifts. 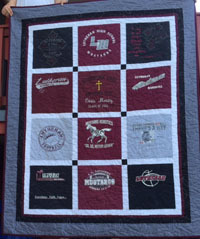 We also make special occasion quilts for weddings, births, and life milestones using sentimental clothing and/or themed fabrics. 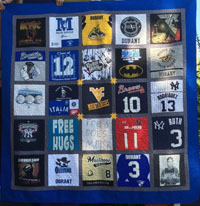 We also make memorial and special occasion quilts to celebrate the life of a loved one, weddings, births, and other milestones using sentimental clothing and/or themed fabrics. We offer special pricing for quilts honoring military, firefighters, police, EMTs, etc. Whatever the occasion, your custom quilt is sure to keep its owner warm and cozy for years to come. Your quilt tells a story…it deserves a label that gives credit to the storyteller and provides history for generations to come. Aerie Designs includes custom embroidered labels on the back of each quilt we make that tells about who the quilt was made for, the occasion the quilt was gifted, the year it was made, etc. Click here to see some samples of labels that have been included on our custom quilts.